The rules regarding unemployment benefits can seem employee-friendly and relatively straightforward on the surface, but employees often meet resistance or have their claims denied for seemingly arbitrary reasons. Having an experienced lawyer representing your interests at unemployment hearings and throughout the application process can help you obtain compensation faster by laying out a clear case for the state. 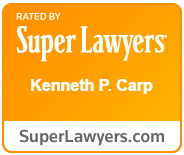 At the Law Office of Kenneth P. Carp, our founding attorney has more than 20 years of experience in unemployment law. Known throughout the nation for his abilities in this complex area, Kenneth Carp can guide you through the entire process, including the administrative hearing and appeals hearings. Initial applications are often denied for reasons that appear to make no logical sense. This is why it is crucial to have an attorney handling the process for you. An experienced unemployment lawyer like Kenneth Carp can help present your case in the best possible light and focus on addressing the real issues that make up the core of these cases. If your unemployment claim has been denied, we can help you file an appeal. An administrative hearing between you, your employer and an administrative judge will be arranged, either in person or through a conference call. We will be fully prepared for this and know how to cross-examine witnesses and present evidence to demonstrate why you qualify for the benefits. Your administrative hearing is the only chance you have to fully present your side of the story. Having our experience on your side can ensure you have the best possible strategy for obtaining the unemployment benefits you need. Contact our firm today to schedule a consultation with our unemployment hearing attorney.